New Images Concrete would like to take this time to help assist you in selecting a contractor for your upcoming project. It is our goal to help protect you, the homeowner, and to assure you that your project is completed in a timely manner, within budget, with a high quality of workmanship and materials. New Images Concrete has put together a few basic guidelines and listed them for you below. By following these principles you can save valuable time, money and worries; in addition to helping us set and maintain the highest of standards in the construction trades. – Ensure that your contractor is properly licensed as required by the State Of California. * Make sure their contractor’s license is current and is in good standing with the Sate. – Be sure that your contractor has general liability insurance. This is to protect you, the homeowner from liabilities arising out of bodily injury and/or property damage occurring as a result of your improvement project. Request a Certificate of Insurance from the contractor before work begins. Concrete construction is becoming increasingly complex, thus the potential for problems occurring have never been greater. Should problems occur either during construction or at some subsequent time there after New Images can help. We have extensive experience in diagnosing and solving many concrete related problems. We have considerable experience under new civil procedure rules in writing litigation reports as well as advising counsel and where necessary giving expert evidence in court. A white bloom or powdery deposit of crystalline material that sometimes appears on the surface of concrete or masonry is called efflorescence. It consists of crystalline salts brought from the interior of the concrete by water, and deposited on the surface by the evaporation of the water. When water moves through cracks and porosity in the concrete, it brings to the surface the soluble calcium hydroxide that result from the reaction between cement and water. After evaporation of the water, the calcium hydroxide remaining on the surface reacts with carbon dioxide in the air, forming calcium carbonate, the familiar white crystalline deposit. Efflorescence can be removed by washing the concrete with water and vinegar in most cases. Southern California water has a high mineral content. When this water is deposited on to sealed concrete surfaces, ie; pool water splashed out, irrigation water from sprinklers, ect… it will evaporate leaving a white residue. Similar to water spotting left on a car after washing with out proper drying. This residue is easily wiped away with a Lime-away solution, but the only permanent solution is a water softener or the removal of the water source onto the treated surface. One common cause of sealer problems is moisture retention in the surfaces to be sealed. In porous materials, such as common brick, Mexican tiles, concrete, ect… There is room for tremendous quantities of water, in many cases; this moisture cannot be seen on the surface. Causes of moisture problems will vary: a high water table, hydrostatic pressure from underground water sources, run off from heavy landscape watering in adjacent areas. We recommend that landscape irrigation water be controlled to prevent water from standing and drying on sealed surfaces and over watering of landscaped areas. Over watered soils can cause problems with efflorescence, thus breaking down sealer prematurely. Sealers serve a very necessary purpose to beautify and protect many concrete and masonry surfaces. Sealers do require some periodic maintenance and the sealed surface life will vary based on the combination of several factors ie; sunlight, uv rays, moisture, over watering, mineral water. There are many types of sealers, Acrylics’, Urethanes, and Epoxies are the 3 basic groups, Each with a particular application and level of performance. The application of clear sealer to newly placed concrete, as per our company’s recommendation as well as manufacturer’s recommendations, the application of clear sealer should not be applied to concrete surfaces prior to concrete being fully cured. The manufacturer’s recommendation is to wait between 2-4 weeks (depending on weather), thus allowing for complete curing and entrapped moisture evaporation to take place. Concrete should be kept clean and free from dirt until concrete can be sealed. Prior to application of any clear sealer, it is always standard practice to conduct a water vapor moisture test. How long does it take concrete to cure and how long before I can walk or drive on it? Concrete cures quickly for about 28 days, then very slowly thereafter for years. In most cases you can walk on it after 24 hours and drive on it after 7 -10 days. Curing of concrete is the final step of the construction process, and one of the most important. Unfortunately, it is also one of the most neglected. In extreme cases, failure to cure concrete can result in reductions of strength up to 50%. Curing or keeping the surface moist to assure greatest hydration of cement and highest potential strength is easily done through spray membranes or other readily available products and procedures. Curing compounds should be applied after the final finishing operation to increase the concrete’s resistance to the effects of weather, and to decrease the occurrence of surface defects. A minimum of 4 inches is recommended. Keep in mind that the 2×4’s often used to form a driveway are only 3 1/2 inches wide, so the ground inside the 2×4 forming needs to be removed at least 1/2 inch below the bottom of the form. Thickness is the major factor (even more than the strength of the concrete) in determining the driveway’s structural capacity. Increasing your driveway’s thickness from 4 inches to 5 inches will add 20% to your concrete cost, but the additional inch of concrete will add almost 50% to the load carrying capacity of your driveway as it hardens, therefore proper spacing of joints is most important. How should the ground be prepared? All organic matter should always be removed- grass, leaves, tree roots, wood ect…, If a tree root is cut off and not removed it will eventually decompose, thus leaving a void below your new concrete and as the concrete settles it will crack. Cracks, settlement and structural failure will often be traced to an inadequately prepared and poorly compacted sub grade. The sub grade on which the concrete is to be placed should be well drained, uniform level or properly sloped and compacted by mechanical means. The sub grade should be moistened with water in advance of placing concrete, but should not have standing water, puddles, or soft muddy spots. Should there be joints in a concrete? Install control joints at a spacing of no more than 10’x10′ or as per contraction joints spacing chart that is recommended by Portland Cement Association. Spacing joints at wider intervals invites random cracking. While such cracks are generally not a structural problem and will not reduce the service life of the concrete flat work, they are unsightly. Also avoid joint patterns that produce small triangular points which have a tendency to break at edges. Lay out your joints to form square or random sections. If in doubt, make the sections smaller, not larger. Ask your contractor to provide a jointing plan as part of his contract and or drawings. What provision can be made to avoid cracks in concrete? First of all concrete is supposed to crack, as concrete hardens it begins to shrink, thus the reason for control joints. ( see joints below ) There are many reasons why concrete cracks. Cracks rarely affect structural integrity. The majority of concrete cracks in flat work usually occur due to improper design and construction practices, such as omission of isolation & control joints, improper jointing practices, improper sub grade preparation, lack of reinforcements, the use of high slump (very wet) concrete (occurred by the addition of excessive water to concrete trucks on site) or improper finishing techniques and inadequate curing. 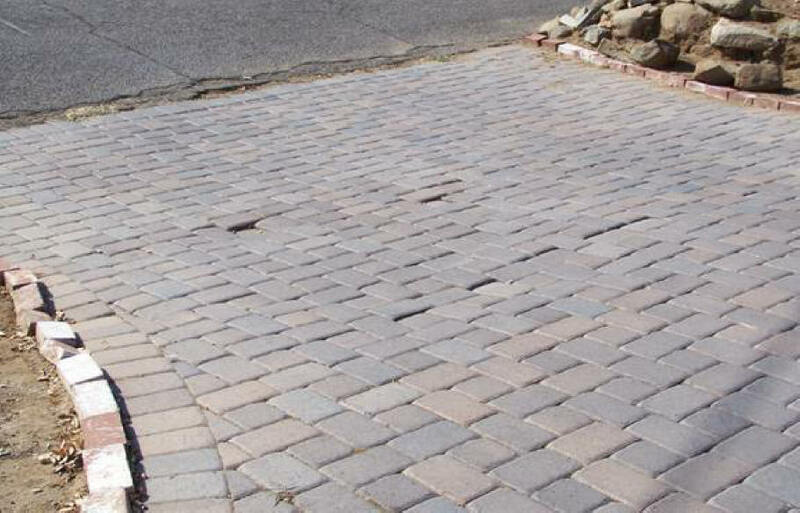 Interlocking pavers, which incidentally are manufactured out of concrete, have the inherent flaw of dramatically settling within only a few years time. Here is the likely scenario: weight is unevenly distributed from the parking of cars or other heavy objects (sheds, Jacuzzis), this will cause depressions or sinking, as water will begin to settle in theses areas and eventually seep down between the pavers into the sub grade below, compromising the compaction, therefore leading to additional settling of pavers, which results is a wavy, unsightly up and down appearance. Additionally, interlocking pavers have the loathsome tendency to foster weed growth that can ultimately become very pervasive. Properly installed and reinforced concrete will allow weight to be distributed over a much larger area, and due to its solid surface, isolating the possibility for water to permeate below . These conditions help to maintain a dry and compacted sub grade. Therefore resulting in a durable and efficient product for the long term. Can I just overlay it? Rarely do I recommend these products for exterior projects. These are widely considered to be only a band-aid fix. Overlay cement is one of today’s fastest growing decorative concrete sectors. Overlays can be applied in many different ways to give the customer the impression that they have received a quality job and have a “like new” resurfaced driveway. Placement can be by trowel or with gage rakes as a self-leveling material. Surfaces might be stamped and textured, flat and smooth, stained, and multi-colored. Owners choose overlays to save money by sparing the cost of removal and replacement. But there are numerous associated failures with overlays that have caused a multitude of problems. If a penny’s worth of prevention is worth a pound of cure, you need to understand the issues involved. The success of the overlay is totally dependent on the condition of the concrete BELOW the overlay. Using an overlay on a cracked or worn driveway, walkway, patio, ect… will look good at first, but have a limited life expectancy and may begin to fail within 2 to 5 years. Assuming the concrete base is in good condition, the success of the overlayment is dependent on not only the materials used, but also the installation. Water vapor transmissions passing through the substrate, and other factors such as temperature changes after the installation, and the different expansion rates of the base substrate and the coating. The concrete industry itself gives warnings about these quick fixes. The physical characteristics of overlaid concrete itself can lead to its own special problems. High maintenance, requiring frequent sealing and re-staining. What color options does New Images offer? Integral color: Concrete can be colored integrally; color is added to the mix at the ready mix supply factory during the mixing process, and then delivered to the job site. Thus providing color throughout the total thickness of the slab. This is a preferred coloring method; if the slab surface is chipped or cracked it would be less noticeable. Dust on color: With this method, powder is broadcast over the surface of the slab, then trowled, providing a surface color that is approx. 1/16th -1/8th in. thick. In this case, if the slab is chipped or cracked, it is highly visible and unsightly, being that the natural grey concrete below the thin layers of surface color will now be exposed. Stains and dye colors: Stains and dye can be sprayed, sponged, or broomed on hardened concrete surfaces to create rich earth tone colors resembling natural stones, rocks, marble and even wood, thus providing a completely custom look to any concrete surface. Multiple colors can be used in a stacking method to create variations distinct to your own project. All stains are custom mixed and blended for each project and applied in multiple stages to achieve a unique and realistic look. Upon completion of all color stain projects, we will specifically package the colors that were used on your project for you to keep. 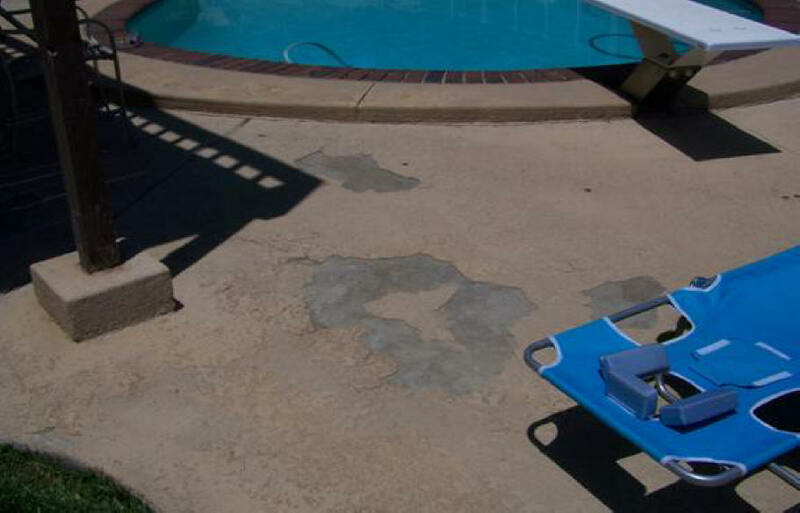 If damages ever occur, or you find your concrete is chipped or cracked, simply take a clean rag, put some stain on it and blot in on the chip or crack and watch is virtually disappear. What finishes does New Images offer? There are many different types of finishes available, starting with standard broom natural grey, to pattern and texture stamping, also exposed aggregate finishes, from light exposed( just showing sand), to medium and heavy exposed looks,(showing the course aggregate rock). How much is stamped concrete per square foot? No two jobs are alike! We offer a unique presentation of educating our clients on new innovative products and installation procedures.